A house of a Hindu family was set ablaze on Saturday night at a village in Shahrasti upazila of Chandpur as a spate of post-election violence against the community continued unabated. No one was present at the ‘abandoned’ ancestral home of Barendra Nath Majumdar at Rayeshree village, when an unidentified gang poured petrol and torched the locked house, reports our correspondent. 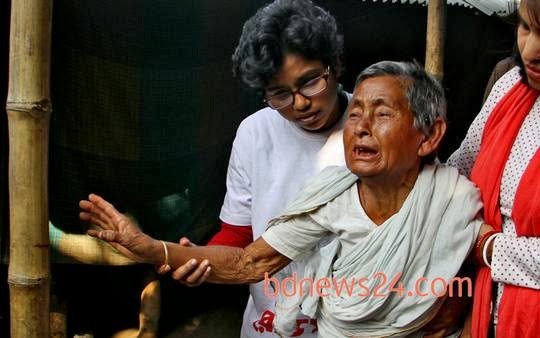 Majumdar, who lives with his family in Narayanganj, yesterday returned to his village and filed a case against unnamed people in this connection with the Shahrasti police station. Meanwhile, police yesterday around 4:30am arrested four people on charge of vandalising four idols on Thursday night at Sharbajanin Kali temple in Shibchar upazila of Madaripur district, reports our correspondent. *Ganajagaran Mancha: Not exactly sure who they are but they supported the war crimes trials, so they are opposed to the Jamaat-e-Islami group, the fanatical Islamists.